On January 27, 2010 Raleigh, North Carolina proved itself as a major social networking hub. Again! 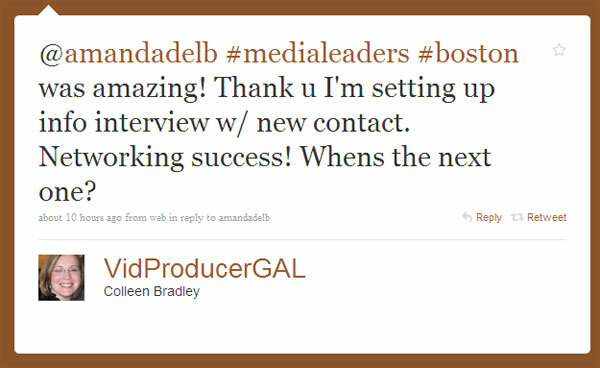 About 3 weeks ago, I saw a link on my Twitter stream about a nationwide networking event called MediaLeaders. I sent an email to Josh Ochs in Los Angeles to see if I could shoehorn Raleigh in at the last-minute. Josh liked the idea and basically told me to grab some people and get going. I had not planned anything of any real significance before, so I knew I would need a lot of help. I had originally bounced the idea off Sarah Burris, and she helped me get excited about it, so I knew I had to bring her in right away. Sarah spends her days doing PR for Carolina Advanced Digital so I knew she’d be a huge help. She handled everything flawlessly. I also reached out to the sharpest marketing mind I know, Brian McDonald. Brian was the taskmaster that we needed to stay focused on making the event something different, something that people would look forward to attending. There’s no doubt we wouldn’t have had the reach we did without Brian McDonald on the team. One of my best friends also happens to be a serious social media workhorse at the MediaTwo Interactive Ad Agency. Morgan Siem has quickly become my go-to girl for all things social. She always had a simple way to fix our complicated hurdles. I had only really known Dan London a few months, but in that time he had really impressed me with his big-picture understanding of marketing, search and social. Dan was there all along the way helping us sharpen the ideas that ultimately led to the big night. Of course Dan did have a weird need to hang around his house after work, something about a wife who was due to have a baby girl the day before the event! We all got used to Google Wave by the end of week one, and by the night before the event we were old pros. I was unsure of its value until that point, but as a collaborative tool, it worked great. Once the team was in place, we had to choose a venue. It wasn’t an easy choice. I love the guys at The Pit, but I wasn’t sure it was the perfect type of venue. I had just met the guys that run Issac Hunter’s Oak City Tavern downtown, and it’s a fantastic place, but we would have had to figure out how to bring in some food and we were short on time. The Raleigh Times was also in the mix, but I thought it might be a tight squeeze. That meant that our best choice was going the The Busy Bee Cafe. It had everything we were looking for. Now we were down to about 2 weeks to see if we could actually get some buzz about it. We were all really excited at the chance to host an event that the awesome Triangle community could enjoy. Step 1 was figuring out what we would do for 3 hours. We tossed around a bunch of ideas, but we kept coming back to wanting to offer something different from Chuck Hester’s LinkedIn Live events, or the Triangle Social Media Club‘s events or random tweetups and meetups. We wanted to put something together that would offer a benefit for C-Level executives as well as more junior people who can benefit from meeting and connecting with them. The MediaLeaders networking concept is on creating a cutting edge junction of leaders in PR, media, marketing, advertising and tech while discussing current events and new ideas. We figured that meant trying to create a relaxed social atmosphere where everyone could schmooze and also make new contacts. We would keep the music low, the interruptions to a minimum and the overall value high. We also decided to have one prize to give away, but not something you could wrap-up. We decided to reach out to 3 of the most influential and smartest people in this orbit and ask them to give up some of their valuable time to have lunch with 3 lucky winners. Andy Beal of Marketing Pilgrim fame, Patty Briguglio, President of MMI Public Relations and Barrett Joyner the Development Director of The Healing Place of Wake County. We arrived and started setting up about 6pm. Sarah had grabbed some adhesive name tags so that as people came in, they could be easily recognized, and also brought about 70 sharpies in every color possible. We set up a small table by the door to handle what we figured would be a manageable crowd of about 75. When Chris Moody from Bandwidth showed up with their giant old-school telephone booth, we knew we were almost ready. Chris has been an awesome force on the Raleigh scene and the photos with their phonebooth has been a huge success due mostly to the beautiful photography of Sledge. A half hour in we had a line down the stairs waiting to get in! It was getting busy, and fast. At 7:40 we took a minute to thank everyone for coming but you could hardly hear us over the PA system because we had already let over 100 people through the door. Thankfully Lisa Sullivan, Leslie Wilkinson, Mandy Steinhardt, Tucker Peterson and Karl Sakas volunteered to help us out. Karl and Tucker estimated later that at least 150 people showed up for the Raleigh Media Leaders event! Everyone seemed to be having a pretty good time, I didn’t notice people starting to trickle out until about 9pm. There was still about 50 people hanging around at 10pm when the event was officially over. By the time Brian and I were lugging laptops, projectors and cables down the stairs at 11pm, there was only a handful of friends keeping us company. That’s what networking is all about. Building a network that can help you when you need help, and offering help when you can offer help. I watched the tweets from the other Media Leaders cities, and they couldn’t hold a candle to Raleigh. When Wayne Sutton talked about the 19 reasons the Triangle is better than Silicon Valley, here is #20. I had a blast helping organize the Raleigh Media Leaders networking event. I hope everyone who attended got something out of it, even if it was just some of the awesome hummus that The Busy Bee provided. We’re already thinking about the next one, but would love to get some feedback about what worked and what didn’t. Thank you to the entire Triangle community for a great night! Awesome recap Phil and great job with the event. I’m looking forward to the next one. Early talk is to do the next one during the SXSW week to give people not down in Austin something else to do. Thank you so much for taking the initiative to bring this event to Raleigh, Phil. The mix of professionals was the perfect blend for us media types. I met a lot of new people, and made a few great new connections. Congratulations on organizing a top-notch event! Great summary of a great evening. Thanks for the shout out and definitely looking forward to the next one. Let me know if there is anything else I can do to help out! @GinnySkal – thanks. I didn’t even know that stuff like this was possible a few years ago. Watching true media leaders like you, I realized that anything is. One of the reasons it took me so long to meet you was because you were one of my first idols since my first tentative steps into the social media scene in the Triangle. So thank you Ginny, you’re inspiring people all around you! @Tucker – ditto right back at ya! I’m looking forward to another one. The best part about the people who offered to help out was that you were all known and respected among the attendees, That’s another reason I love the Triangle social media scene – less ego, more love. I heard a lot of great things about this event. Hats off to everyone that planned it. You guys did a great job. I was really surprised to see the number of people that were attending. Lots of great pics. Great job pulling this together Phil. I am impressed. Sorry to miss last night due to illness but everything each of you say about our community here was amplified by our experiences last week at the international ScienceOnline conference at Sigma Xi and the RTP. Wayne’s Ignite talk was outstanding and we noted in my session how local gurus like Ginny avail themselves everywhere (in our case, to our NCCU first-year student bloggers) to enhance the community. I haven’t met all of you yet but I follow many of your activities – great to call you neighbors and I look forward to the next gathering. Congratulations to all of you for making this a success. Yep, awesome re-cap for an awesome event. I honestly can’t believe you guys were only pushing it for two weeks. No matter how much it was just “thrown together” or “shoehorned in,” it was a resounding success. I didn’t see a single person there who wasn’t having a great time. Phil – thanks so much for bringing me on board for this event. It was a blast every step of the way. The event’s success is just proof of the awesome Raleigh network. Without such an engaged and supportive community, we never could have spread the word so quickly, generated any buzz, attracted such a long and stellar list of attendees and pulled it off. Thanks to everyone who helped, supported and attended. I honestly had a great time and look forward to meeting even more of you at the next one. @David – I missed ScienceOnline, but I heard it was a huge success! You’re right about the community, especially Wayne and Ginny who seem to be everywhere. @Joshua – I love that you come all the way down from far-off Hillsborough for stuff in Raleigh. It would be hard not to have fun in a room filled with awesomeness! Phil and team, excellent job organizing this event! 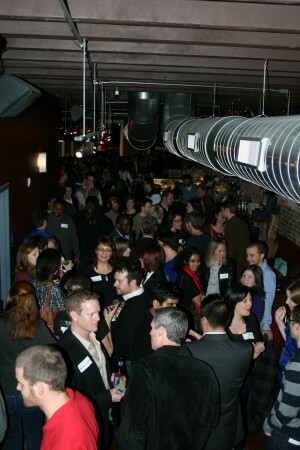 It was my favorite networking event I have ever attended here in the Triangle! Looking forward to many more! Thanks for organizing this event. Great turnout and great people! I had an awesome time (even though I had to leave a little early to watch my Tar Heels beat the Pack)! @Gregory – Thanks, I saw you zoom by me a couple times, you were on a mission! Glad you liked it. @Mike – thanks, it was awesome finally meeting you IRL and some of the old school N&O folks, just wish we could have persuaded a few more to come by. Phil, I had no idea this event came together in just two weeks…phenomenal. All of you did such a great job putting this on. It was a wonderful opportunity to meet so many local folks, all of whom have such a positive impact on Raleigh. Everything from the check-in to the photo booth was a hit. Thanks for letting the rest of us benefit from your hard work! Of course mingling with “the beautiful people” doesn’t hurt either. @Jenni – I have to turn that around, the event really benefited from all of the cool people like you that really bring in so much energy and happiness. I know I’m sort of flogging a nearly dead horse, but the Triangle Social Media scene is just top-notch! Many thanks to Phil, Morgan, Sarah and Dan for coming together to make this event just awesome. When Phil told me about it I was nervous that we did not have a lot of time to prepare and get the response we did. I have to credit that to the enthusiasm and passion this team displayed and the right mix of experience and backgrounds. As a 25+ year resident of Raleigh I’m so proud of the collective media leaders we have and know that it will continue to grow. The event was able to bring so many people together that share that creative thread and allowed us to meet new faces as well as catch up with old friends. To everyone that participated I want to say thank you and I wish I had time time to meet new contacts. Also if you see me at an event or on the street, please feel free to come up and say hello and introduce yourself. The opportunity to grow your network is always present. Thanks to the Busy Bee/Hive staff and owners for working with us too. We could not have made it happen without the right venue. Chris Moody, Sledge and Phonebooth were awesome and jumped right in to fill our photography needs. I cannot say enough about the Bandwidth.com team, you guys rock. Wayne Sutton and Lawrence Ingraham worked with us to create the Tri-Out banner to add some extra flair. I also want to thank Jeremy Smith who could not attend but gave me some killer ideas and feedback that helped us shape the event and make it special. @Brian, thanks for pointing out the big help Tri-Out was for us. Lawrence and Wayne really stepped up and made it easy. Thanks for organizing a great night of networking, and also for posting a picture that has a profile shot of me near the bottom of the pic, looking serious and engaged in conversation with Shane Johnston. Of course that is why you used that picture. . .
Phil, this was a great write up for an equally great social event. As I mentioned to many that night, it’s exciting to see an online community come together in one place and get to know and learn from each other. Thank you and all those who helped build this vibrant community here in Raleigh. I look forward to the next event, please let me know how I can help. @Ted – you’re right, I learned a couple of things that night while chatting with people that only come up in face-to-face situations. Glad you could attend. Great recap Phil. Congrats again on a fabulous event. All you folks should be very proud. When is the next one? I am in! Phil and team, looks like a great effort. Okay, so now I kinda wish I would’ve driven in town to attend. I got some interesting comments from folks who didn’t attend. What feedback did you get on value from the C-level execs in attendance? We should compare notes some time. @Chris – it was great having you guys there, the phonebooth photos are always a big hit. @Ryan – We should try to meet up after work soon.